We spend a lot of time working with our Fanz writers virtually – emails largely, but sometimes SMSes/WhatsApps or the odd phonecall. Having the opportunity to meet them in person and speak face-to-face becomes a valuable and precious opportunity. FunDza has recently brought out four new publications (our anthology Hero Within and other writing, our funzine publication Double Trouble and much much more, and two pocket booklets as part of our After School Action Series project – A New Beginning and Spear of Words), in partnership with our publishing friends at Cover2Cover. Much of the content in these publications has been written or contributed by mentee or Fanz writers. We thought now was the time to have a celebration of sorts. 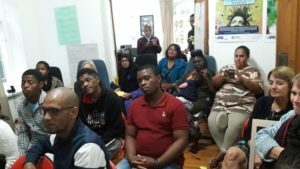 Many of the writers live in other parts of the country so were not able to make it… but we gathered together those who lived in Cape Town and its surrounds for a private celebration event at the FunDza offices on the evening of 7 March. What an amazing event! Mignon welcomed everyone and asked all the FunDza and Cover2Cover staff there to introduce themselves as many of the writers would have had some contact with a number of them in the past. Ros then spoke about the anthology Hero Within and other writings, explaining how this publication came out of Rights projects, the latter one which focuses on the deep divides and structural inequalities that remain in our country, and which uses the power of stories to help bridge these divides. Those writers who had contributed to the anthology were asked to read their poem, or a short part of their story or essay. We had Pamela Mali, all the way from Kuilsriver, reading her poem and comment on the safety of women – “A letter to South Africa”, Sicelo Kula – a long-time FunDza writer and now lawyer read a portion of his highly topical blog “Sell Me Some Witchcraft, Please, UCT student Athenkosi Cetyana reading a portion of his richly evocative essay “A Familiar Stranger in my House”, Tristan Skippers speaking to our hearts about the pressures of living in Lentegeur through his powerful poem “Hard to Stay Alive in 7785”, and then Maxine January reading the ending of the emotionally-charged and inspirational story “Hero Within”. 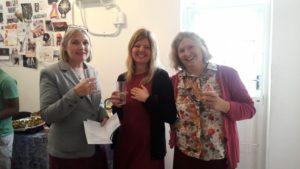 Dorothy introduced our new funzine publication – a blend of a fun-filled book and magazine with lots of different types of writing – called Double Trouble and much much more. Again this included a lot of our Fanz or mentee writing. Refilwehape Mofokeng – a former FunDza intern and young writer who is not at UCT, read a portion of her essay “The struggle of being different”, Lukhanyo Matshebelele – FunDza’s technical uploader who started out as a Fanz writer – read from his blog about attitudes around initiation “Man to man”, Allison Matroos read her heartbreaking poem to her late brother ‘n Sussie se verlange, and Hector Bululu – whose writing appeared in both publications read his Xhosa poem. Then, Ros introduced the After School Action Series project and the two pocket booklets that came out of it. Both were written by young writers who had first come in to contact with FunDza through a writing workshop project in 2013. We’re so pleased that they’ve stuck with us through the years and continued to put pen to paper. Nosbusiso Tshetu read from her story A New Beginning a portion about the struggle of fitting in. While Asiphe Besethi championed the power of debating and words in his reading from Spear of Words. Mignon and Palesa, MD of Cover2Cover handed over copies of the publications to each of the contributors, thanking them for their writing. The evening had been emotionally charged thanks to the openness in the room and the heartfelt readings. 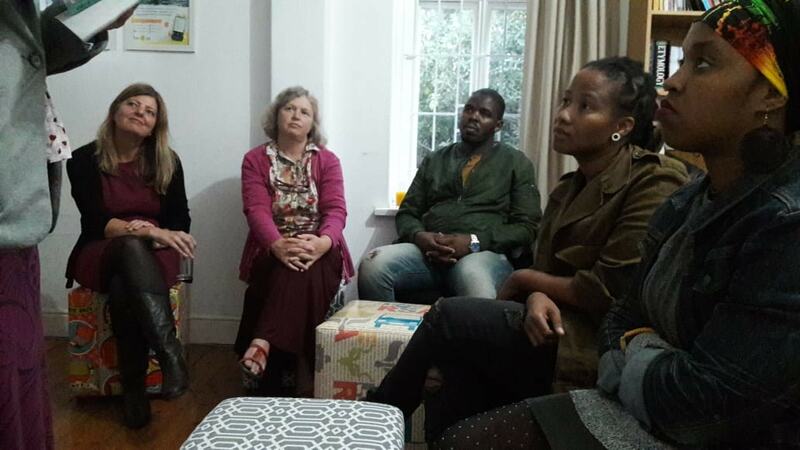 Thank you to Malusi Ntoyapi who had come to the event and who suggested that we use it as a space for discussion and reflection. The writers were able to talk and share, and be challenged too. They spoke about the process of pen to paper, and about the pain that often hides behind the pen too. They spoke about whether they see themselves as ‘a writer’. Nosi had said, “No, she didn’t… but holding booklet in her hand with her name on it may help to change her mind.” Tristan said that he just writes. He can’t stop writing. But he didn’t know what to do without a platform for sharing his voice, his story. We’re proud that FunDza is and can provide this space for writers through its virtual online reading writing fundza.mobi platform. But we also know that must be more… the face-to-face interaction, the opportunity to come together, to listen to one another and to share, is vital too. Seeing everyone’s shining eyes, open hearts and gratitude for the community space, we know we need to find ways of doing this more. Thank you to the hard-working organisers of the event: Kim Coleman from Cover2Cover, Alonzo Naude and Dawn Wilson of FunDza. And, thank you to Ros and Dorothy for their careful selections of work for all the publications, and to the Cover2Cover team for making them beautiful. You have done us all proud.